Hi Linda. Unfortunately we are not familiar with installers in your area. Epoxy needs an average temperature of 55 degrees or higher during application and the curing process. A polyurea polyaspartic coating system would be a better choice for you when dealing with cold weather temps. They are also resistant to U.V. rays if you have a southwest exposure. Enjoyed reading your information, and now a possible silly Question!! Son lives on a boat and would like to refinish bathroom, by removing toilet, tiny tub, and use an epoxy “garage” type finish. Big question is, the floor is Marine Plywood. Is this a possibility? Hello Bob. Epoxy is actually common for certain uses on boats. We suggest visiting epoxyproducts.com. They are experts in the marine epoxy arena. To be honest, their website technology is extremely dated and makes for a navigating nightmare. Our suggestion is to give them a call. From what we understand, they would much rather talk with potential customers anyways to make sure they get the correct information and product. 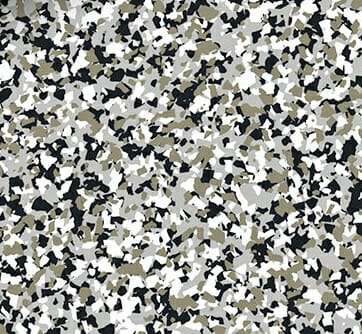 I am considering an epoxy floor covering for our small veterinary office. We have a high traffic office and a low traffic exam room where small livestock patients are occasionally(sheep, pigs, goats). The exam room has a drain in the floor. We originally stained the floor and applied a topcoat of polyurethane. The result was very unattractive because the concrete is smooth in some areas and rough in others. We ended up painting over it with Sherwin Williams floor paint with shark grip added to make it less slippery for our cloven hooves patients. The problem with this is that the surface scratches easily and attracts dirt. Even when it is just mopped it looks filthy. Hello Jane. Yes, epoxy is actually very common for veterinary offices, kennels, and etc. Properly done, it stands up very well, it’s sanitary, and it’s easy to clean. You don’t want to use the store bought DIY kits, however, as they are not going to last. You will need a commercial quality, high solids epoxy. Because of the paint you currently have on the concrete, you will need to grind the surface to remove the old paint and properly profile the concrete. It may be to your benefit to have commercial installer do it for you. They would be much quicker and can put down a product that only needs 24 hours to cure before you are back in business. What type of business Can I contact to do this professionally? It’s too big of a job to do it myself. Hi Stacy. 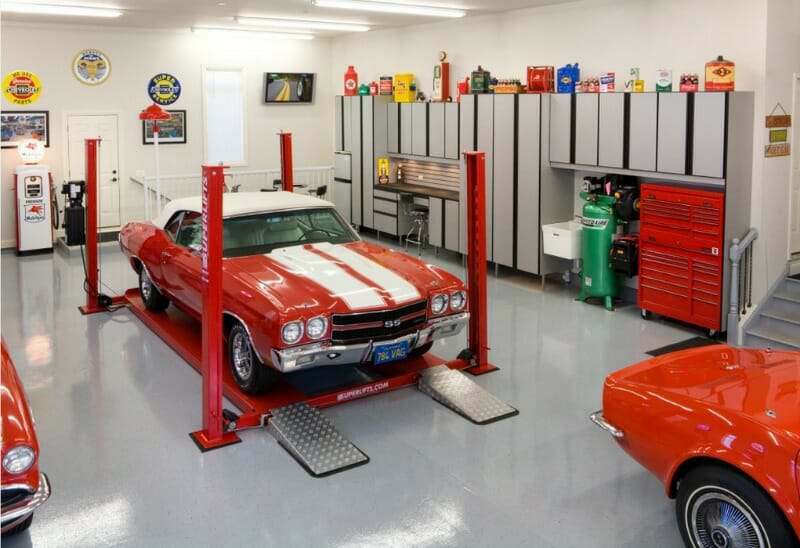 You would need to contact a garage floor coating contractor. Google can be your friend. Search for your area. 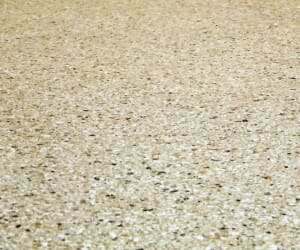 We have an excellent article on how to choose a floor coating contractor here. I’m leaving town in a week, and will be away for 3 weeks. If I etch before I leave town, and let the floor dry in that time, do I need to re-etch when I return, or can I apply the epoxy as soon as I’m back? You will be fine, Sam. Etching physically changes the surface of the concrete. It cannot change back or anything like that. Just make sure to shop vac the surface when you get back in order to remove all the dust that will have collected while you were away. $4sqft is way too high for an epoxy installation. $1.75 – $2.75 at most. I’m sorry, Kyle, but we have to respectfully disagree with you. 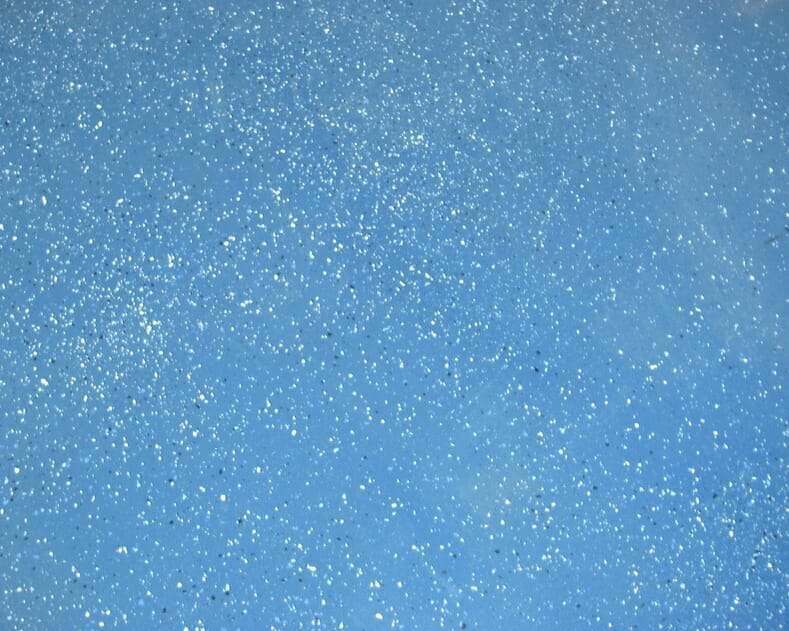 Cost of materials alone for a commercial quality epoxy floor installation is going to run approximately $1.50 per square – more depending on options. That doesn’t include the labor for installation and overhead as well. 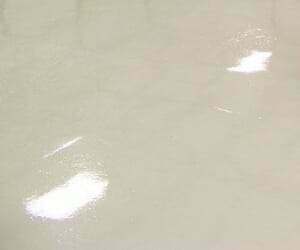 The only epoxy installation you are going to get for that price is a lower quality epoxy, one coat job from a handyman or painter. You truly get what you pay for when it comes to floor coatings. I have a new garage. How long does the cement have to cure before I can put the epoxy on? Also do I have to do anything to the new concrete before applying? Hello Johh. You need to let new concrete cure for a minimum of 30 days before applying a coating. You will need to either acid etch or grind the surface of the concrete before epoxy can be applied. New concrete requires it just as much or more than older concrete since troweling of the surface tends to close the pores more. A friend of mine has epoxy flooring in his airplane hanger. He is willing to let us hold an event in the hanger for our class reunion but he is concerned about tables and chairs legs on the flooring. I certainly do not want to damage his floor. Do you have any suggestions that we can do for the rented tabled and chairs so his floor is not damaged. For this article, it would seem to me that the flooring should be able to handle the table and chairs for one evening. But I would like your opinion. Hello Deb. Sharp metal edges is what can scratch coatings. For example, a metal folding chair with any edges that contact a coating can possibly cause scratches if it slides when a person sits down and scoots the chair around. However, most rental tables and chairs have vinyl or rubber foot pads and will not damage a coating no matter how much someone scoots or slides around. We suggest contacting the rental company to verify. Do you have a recommendation where I can purchase a commercial quality epoxy floor materials for a DIY product. Most are purchased online, Gene, and not from home improvement centers. EpoxyMaster, Garage Flooring LLC, Legacy Industrial, ArmorPoxy, and Garage Coatings.com are just a few. Hi! We want to turn our garage into a game-room, and first thing we want to do is Epoxy on the floor. Specifically, we love the color and flooring of the picture on this page. Do you have the information for what paint and coat the floor in the picture is? Hi Sherry. You aren’t the first to ask that question. We’ve tried to contact the coating contractor before to find the color flake code that was used, but we didn’t have any luck. That floor consists of an epoxy primer, a high solids epoxy base color coat, color flakes to full refusal, and a couple top coats of clear polyurethane. 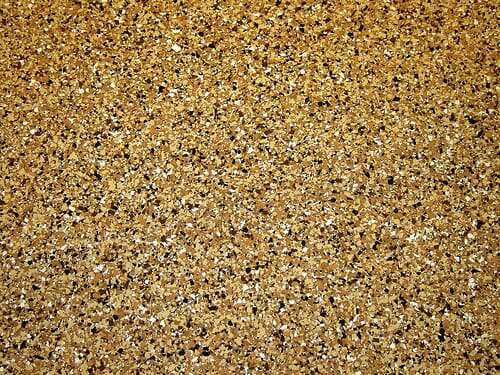 It’s the color flake mix that give the floor it’s main color. 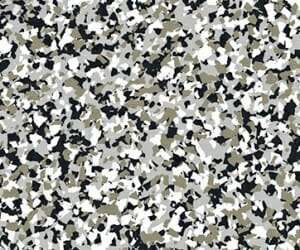 Your best bet would be to show that image to the floor coating contractors you interview or if you are doing it yourself, show the image to the vendor you purchase your color flakes from. Also, so as not cause any confusion, epoxy is not paint. 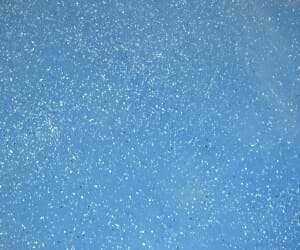 Paint is a latex acrylic product that is not very durable. Epoxy is a resinous coating. This article explains the difference. We painted our garage with epoxy and for some reason it didn’t adhere well. We were told it was too hot as it was in the Florida summer. Hello Pilar. If the the old coating did not adhere well, applying a new coating over the old will only make the problem worse. As the old coating peels up it will take the new coating with it. What type of concrete prep did you do before application? What epoxy product did you use? What needs to be done is remove the old coating via grinding and then apply a new coat. Hi Raymond. Epoxy is not a good choice for a porch. The main reason is that it is not U.V. resistant and will quickly yellow. It can also begin to break down and begin to chalk. A 1-part epoxy paint would be a better choice. It’s essentially latex acrylic paint fortified with a little bit of epoxy added. Latex will not yellow and does well when exposed to sunlight. This article explains the difference. Dryloc E-1 is our favorite. Epoxy-Seal by Seal-Krete is another 1-part epoxy that offers a multitude of colors. Paint such as this will not be slippery when dry, but if your porch will be exposed to water it would be a good idea to mix in some anti-slip grit in the final coat. 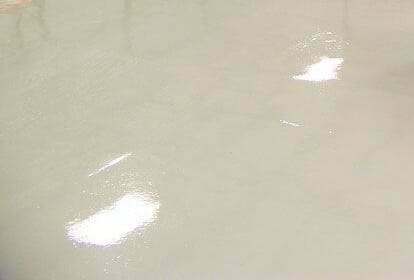 You have mentioned that an epoxy garage floor coating is not a paint, however, it cures the flooring. I’m just wondering if I should just use it instead of the tiles. Any suggestion? Thanks for your help. Hello Joy. Epoxy does not cure the floor, the epoxy itself is what cures in order to become hard. This process begins once the 2-parts are mixed together. I’m not sure what your project is in regards to tiles, so I don’t have an answer for you there. 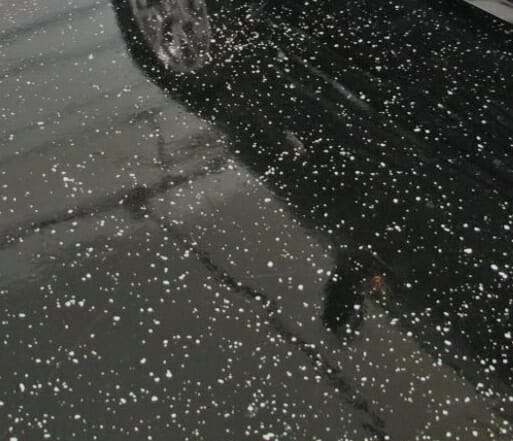 Hi, I live in the upper midwest, my garage floor is heavily damaged from salt dripping off the cars in winter time. Stones mixed in the concrete when originally laid are appearing on the surface from the salt damage. Over the years the smooth concrete surface has gradually worn away. Can I lay epoxy floor over this? If so what are the proper steps? Hello Don. You don’t want to apply epoxy over such a surface. It will not fill in the bad spots to smooth things out and look nice again if that is what you are thinking. What you need to do first is fix the spalling and pitting with the appropriate repair material. You then will need to grind the surface of the concrete in preparation for the epoxy or coating of choice. The grinding will provide the proper surface profile for a coating and will smooth out the repaired areas as well. We would suggest using a more aggresive machine such as a single disc Edco. 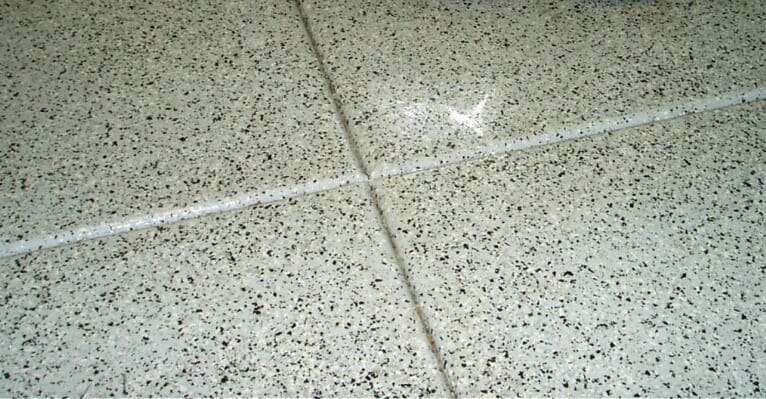 The Diamabrush does not work as well for smoothing out larger repair areas. You are trying to accomplish the same thing as you would if you applied repair putty to a block of wood or patch repair to a car fender. You want things to blend so that it will not telegraph through the coating. 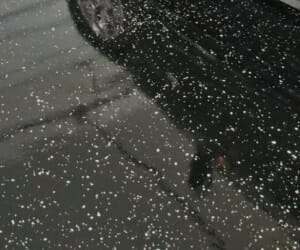 As a tip, a full color flake coverage helps to hide many of the small irregularities in the surface. Hello – I have a professionally applied garage floor epoxy with a clear coat finish that is about 5 years old. I moved in about 6 months after the previous owner had it installed and do not know any other details. It has held up well in our very active snowy environment but looks like it should have another clear coat application as it is showing signs of dulling and wear. There is no flaking or peeling – just the heavy traffic areas are without luster and the clear coat looks worn. I would like to keep the epoxy from getting damaged so I thought that another clear coat layer of some sort might work. Is there a specific process or product I should use that would work the best? Hello John. Yes, applying a new clear top coat can rejuvenate a floor and make it look new again if the color coat has not been worn. We would recommend a high performance polyurethane or polyurea clear. A single-part polyurea is the easiest to work with. It will require that you rough up the surface with 100-120 grit sandpaper before applying the coating. A quicker method would be to rent a floor maintainer with an 80 grit sanding screen. Either way, prepping the surface in this manner will remove much of the top layer of embedded dirt and debris and create a mechanical bond for the clear coat to adhere to. After you sweep and vacuum up the dust, wipe the surface with denatured alcohol with a lint free cloth and you will be ready to go. We have a rough concrete floor in a barndominium that also needs leveling and smoothing to make ready for wood laminate flooring. A pretty finish is not needed, just a smoother surface. Do you think an amateur could apply the epoxy coating with success to accomplish our purposes? Hi Janice. Epoxy is not for smoothing out and leveling surfaces. 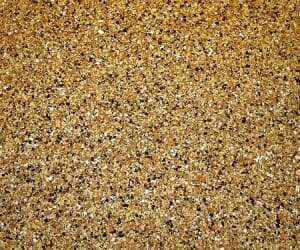 It’s purpose is an extremely hard and durable decorative concrete coating. Concrete has to be properly prepped via acid etching or grinding in order to apply it. It sounds like what you need is a self-leveling underlayment such as this one here. These underlayments are designed to smooth out and level surfaces before applying a floor covering. They are easy to work with and come in both quick set and slow set formulas. I would like to know if expoxy paint is a good product to be applied to a previously vinyl tile covered basement floor. The basement dry and is approximately five feet below ground. Hello Lisa. It can be done if they are vinyl composite tiles (VCT) and not asbestos tiles. It is not an easy job, however, and most epoxy manufacturers will not warranty for application to VCT tiles. Also, you cannot use home improvement epoxy kits. This article here discusses how to epoxy over VCT. I have a 2 car garage that I applied water based cement stain after etching 15 years back. The stain has held up well but is showing signs for wear. Can I apply the epoxy coating after etching again or will the cement floor require grinding? Hi Leonard. Is what you applied an actual stain that soaked into the concrete and stained it or was it something that provided a thin protective colored layer of stain? If it’s the former and you did not apply a clear coat to protect the concrete and make the color pop, then yes, you can etch the concrete and apply an epoxy directly over it. The stain will not have any effect on the epoxy since all it did was change the color of the concrete. However, it you applied a product that coated the concrete with a stained coloring, then you will need to grind that off in preparation for the epoxy. 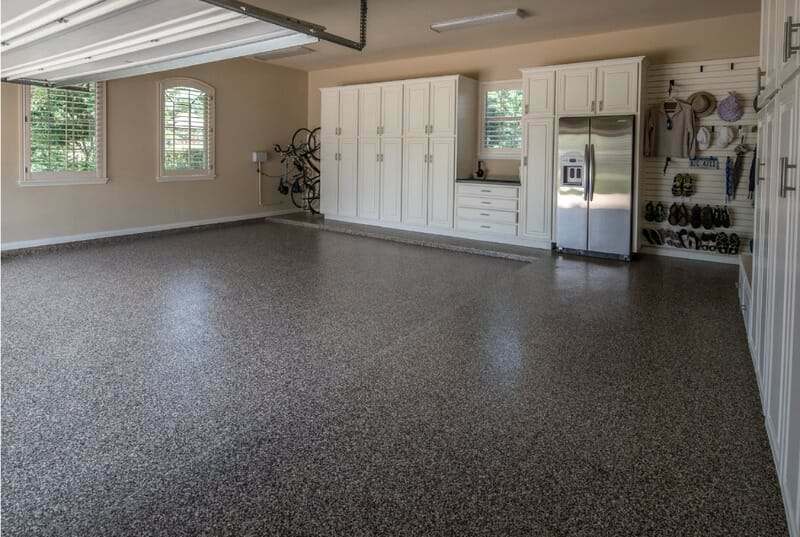 Do you have any specific product recommendations for DIY with my garage floor? I am experienced in doing all sorts of jobs around the house including completely finishing my basement (the inspector wanted me to teach some of the other contractors!). I am not afraid of spending the time to clean and power wash the floor, etch and apply the various epoxy coatings. Hello Gary. There are many quality vendors who sell excellent product and our sponsors are a great example. Legacy Industrial, Garage Flooring LLC, EpoxyMaster, ArmorPoxy, and Garagecoatings.com are some of those. Most of them offer a kit form that consists of an epoxy primer, high solids to 100% solids color base coat, and a high performance polyurea or polyurethane clear. That type of system is going to provide the same commercial quality as what professional installers provide (many use the same products). We suggest giving a few of these vendors a call and tell them about your project. They will make recommendation for you based on your budget and needs. Their customer service is good and they want you to have a successful project. Hello, can you recommend an Epoxy to use on concrete floors in a basement? The basement will have a bedroom, bathroom, etc so not the wear and tear of a garage I suppose. But I want something that looks nice and will last. I also think I want a thicker application so it feels “softer or more cushiony” when walking. Hello Dan. I think you may be getting epoxy coatings confused with something else. Epoxy cures extremely hard. In fact, it’s harder and stronger than most concrete. Hello, I am thinking of doing my 1200 sq. ft. garage with TSR Concrete Coatings in Northern Illinois. They came down from $8 to $5 a sq. ft. after talking with him for awhile. They are going to grind the floor, fix two minor cracks, apply polyurea base coat, put acrylic chips down, remore excess chips and then apply Polyaspartic top coat. They are going to do the steps that lead into the house and the 4 ledge around the perimeter of the garage. What do you think? Hello Guy. That is a very reasonable price per square foot for that type of garage floor coating. Just make sure they put everything they say they will perform in writing and don’t forget to ask about their warranties regarding application and defects. Shea, thanks for the help. You make this easy to understand and your honesty is what people need when making a decision that costs a lot of money. When you say “grind” the previously painted surface as a preparation, do you mean to sand it off completely, or just scuff it to provide a “tooth” for the epoxy to adhere to? And will any primer work? I am thinking of using a product called Dry-Lok which will block out any possible moisture coming up from under the concrete slab. Or does it have to be a specific primer that epoxy will better bond to? Hi Steven. If the concrete has an acrylic latex paint or 1-part epoxy paint then the it needs to be removed completely via grinding. Paint does not adhere nearly as well as an actual 2-part epoxy or similar coating. The coating system is only as good as what it is adhered to. If it is applied to paint, then it will still peel up just as easily since it’s the paint that is adhered to the concrete and the actual coating. The type of primer you want to use for a quality high solids coating is an epoxy primer. Primers are not used for the lower solids DIY epoxy paint kits. If you suspect possible moisture issues, there are moisture vapor blocking epoxy primers that can be used as well. You do not want to use DryLoc. It is an acrylic latex paint and is not compatible with epoxy or similar coatings. Also, it will not adhere as well either. This article explains the differences between paint and epoxy. Do you have any recommendations for contractors in Georgetown TX area? We would like installation made by a professional. What time of the year would be the best for installation in our area? Hello Rune. No, unfortunately we don’t have that kind of information. 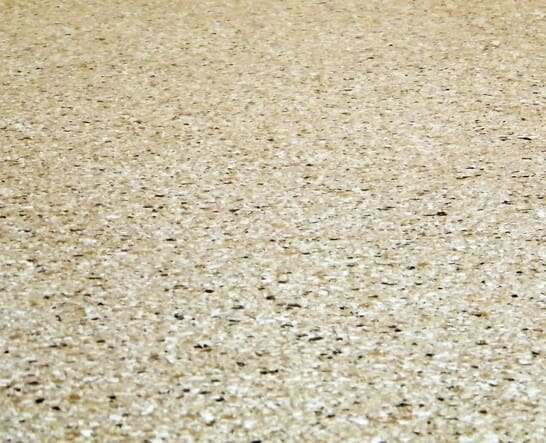 However, we do have an article here that talks about how to choose a floor coating contractor. What time of year you have a coating installed is sometimes dependent on what type of coating that you choose to go with. Coatings that use epoxy need weather above 50 degrees during the application and curing process in most cases. If you choose to go with a 1-day polyurea polyaspartic application, then weather isn’t much of a factor. Hello Chris. We can’t tell you how long Epoxy2U has been in business, but we can tell you that their internet presence with their entire product line is fairly new. We reviewed the data sheets for some of their products. They seem to provide quality commercial grade coatings. What we would be more wary about would be the installer. Epoxy2u follows a business plan that is similar to another floor coating manufacturer in the Los Angeles area. Epoxy2u provides limited training classes for people to start their own floor coating install business and then these installers use Epoxy2U as their supplier. We know from reported past experiences that some consumers have had issues with these type of installers and the quality of their work. Issues ranged from poor installation practices, to operating without a business license and/or proper insurance. Of course not all installers who have been trained in this fashion are inexperienced or lack proper business credentials. Some can be quite good. I suggest reading our article on how to choose a floor coating contractor and use some of these principles to ask your installer some basic but important requisite questions. You will get a better idea if this person/company is the one for you or not. Yes, Epoxy2U very reputable supplier. We have been using their materials during the last 2 years. High-quality resins and technical support. Thanks for your quick response. I was worried about the same. The guy has videos that all started only 3months ago as well. He claims he is training other guys around in the area. I will find out more info. I also spoke with the local franchise of Garage experts which offers lifetime warranty on garage floors and cabinets. He claimed they use garage experts proprietary stuff and comes with life time warranty and he seemed knowledgeable. If you have any experience with Garage Experts, do let me know. Thanks. It sounds like you are learning the process, Chris. Just follow many of the suggestions in our article about choosing contractors to help you pick the right one for you. Garage flooring has become very popular for home owners in the past years and as a result there are a lot of brand new start ups and installers trying to cash in on the business. You get what you pay for as well. If one guy is saying he can do a particular type of coating for a lot less than someone else, then there is a reason. They are either cutting corners, materials, or both. Rely on references if necessary and make sure they are licensed.